All lots have city sewer & will have shared wells with a well agreement. Hawks Landing offers country home sites with green meadow, preserved stone fence lines & meandering walking paths. These sites provide a unique blend of rural character, privacy & convenience. 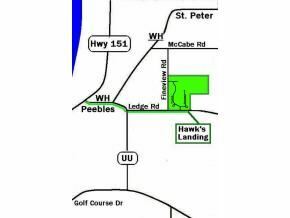 Located about 1 mile east of the 151 bypass, Hawks Landing is just minutes from Fond du Lac. Taxes based on Use Value Assessment. $230 would be your approximate monthly principal and interest payment. This payment is based on a 30-year loan at a fixed rate of 4.12 % with a down payment of $5,280. Actual lender interest rates and loan programs may vary.